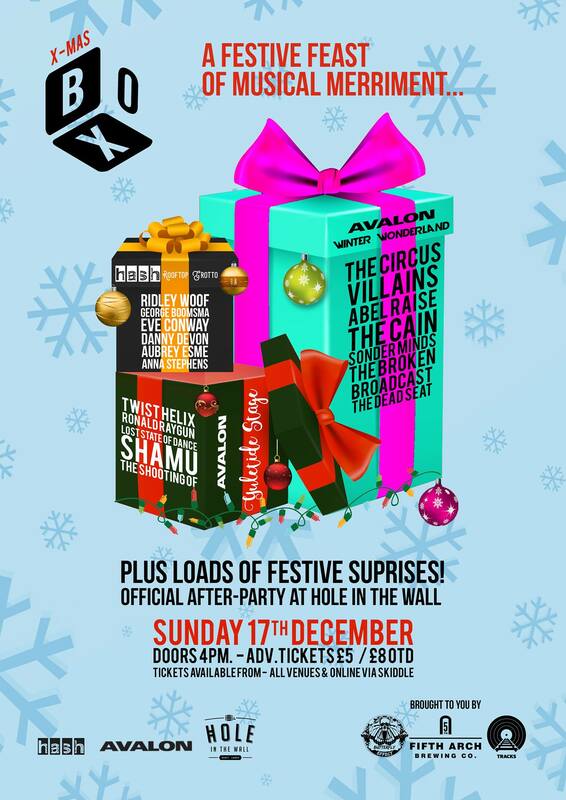 ...WE'RE BACK with a festive Music Box spin off on Sunday 17th December, imaginatively called 'X-mas Box'. It's a yuletide micro-fest (in association with Fifth Arch Brewery, Tracks & Butterfly Effect) that showcases the North-East's finest musical performers and includes beautiful decorations, Christmas film projections, seasonal food and drinks as well as other X-mas surprises. Winter Wonderland Stage (Avalon) – An enchanted outdoor utopia of epic/melodic/roots inspired indie. The Circus Villains – Rock ‘n’ soul. Abel Raise The Cain - Epic, orchestral, indie-rock. Sonder Minds – Lo-fi, tender-psych. The Broken Broadcast – Dreampop/indie-folk. The Dead Seat – uplifting gospel meets chain-gang blues. Retro Yuletide Stage (Avalon) – Christmas nostalgia soundtracked by 80’s influenced, synth fuelled, electro-pop. Twist Helix - Euphoric synth explosion. Ronald Raygun - Experimental groovy electro. Lost State of Dance – A megatronic rave up. The Shooting Of - Heartfelt pop music. Rooftop Grotto Stage (Hash Bar and Kitchen) – A secret, festive hideaway with intimate acoustic, folk & pop performances. Ridley Woof – Jazz tainted alt-pop. George Boomsma – Sensitive alt-folk. Eve Conway - Gritty urban soul. Danny Devon - Acoustic indie-folk. Aubrey Esme – Acid folk. Anna Stephens - Melodic piano-pop. Oh and if that's not enough, there's an aftershow party at Hole in the Wall.